A few commenters have questioned my power calculation on the Oregon Medicaid study, claiming different results. Though I can’t be sure what they are doing wrong (if anything), I did take the time to do several more checks of my calculation. These are in the technical footnote to this post. * Even though it’s weedy, if you’ve followed this story this far, you might want to look. It shows how you can do power calculations at home, with no money down! Meanwhile, the offer stands: if you find an error in my work, please let me know, but read the footnote first. No, the blood pressure analysis was no more adequately powered than the blood sugar one. Even though the baseline rate is a lot higher, the hypothesized effect size isn’t. However, the study was powered at the 0.85% level to find a reduction in proportion of the population with high blood pressure of 3 percentage points (more than twice the point estimate effect size). See, power depends on what question you’re asking. I’m told, but have not independently verified, that the RAND HIE did find statistically significant results on blood pressure. That study had a sample size of 7,700 across four levels of cost sharing and followed participants for 3-5 years. The design and analytic approach were different than the Oregon Medicaid study, which could explain a difference in statistical significance. Also, RAND’s effect size was larger. The confidence intervals of our estimates of the impact of Medicaid tell us what effect sizes we have the power to reject. This can be read off of our reported confidence intervals. Consider, for example, the case of blood pressure. Table 2 indicates that over 16 percent of our control group has elevated blood pressure. For diastolic blood pressure, we see in Table 2 that the lower end of our 95 percent confidence interval is -2.65 mm Hg. This means that we can reject a decline in diastolic blood pressure of more than 2.65 with 95 percent confidence. For context, it is instructive to compare what we can reject to prior estimates of the impact of health insurance on blood pressure. In particular, the RAND Health Insurance Experiment – which varied only the generosity of insurance coverage among the insured and not whether enrollees had insurance at all, as in the Oregon Health Insurance Experiment – found a reduction of 3 mm Hg in diastolic blood pressure among low-income enrollees. Quasi-experimental studies (previously published in NEJM) of the one-year impact of the loss of Medicaid (Medi-Cal) coverage among low-income adults found changes in diastolic blood pressure of 6 – 9 mm Hg (Lurie et al. 1984, 1986). The estimates in Table 2 allow us to reject that Medicaid causes a decline in diastolic blood pressure of the magnitude of the effects found in these prior studies. (These RAND and Medi-Cal estimates are based on a sub-population in disproportionately poor health, so one might instead compare their estimates to our estimates in our Appendix Table S14c showing the impact of Medicaid on diastolic blood pressure among those diagnosed with hypertension prior to the lottery. For this group we can reject a decline in diastolic blood pressure of more than 3.2 mm Hg with 95% confidence). I don’t know what else I can say about all this. If you want to know if the study could reject the possibility that Medicaid had no effect on the physical health measures examined at 2-years of follow-up with 95% confidence, the answer is “no.” At the same time, the sample size was too low to be able to do that for all but very large effects. That’s just a mathematical fact. For effect sizes one might reasonably consider appropriate (and that are certainly clinically meaningful), the study would have had to have been several multiples larger (a factor of five is what I get). Again, that’s just math. * TECHNICAL FOOTNOTE: In contrast to what most people may think, I largely post on TIE to further my own knowledge and understanding, not to convince anyone of anything. So, if anyone finds errors in what I’ve written, I’m happy for the correction. But, I also recognize that I’m posting for a wide audience, and so I worry about the validity of the content of my posts long after they’re public. I continued to worry about my sample size calculation yesterday and this morning. To increase confidence I had not made a grave error, I did my sample size calculation two additional and independent ways. First, it turns out Stata’s sampsi can be used many ways to do the same thing. Some ways require less input than others, which is safer since it is always possible to misunderstand what the proper form of the input is. Nevertheless, no matter how I used sampsi, I got the same answer, which is comforting. Why did you choose a beta of 0.95 instead of 0.80? As for rejecting the decline in diastolic of 3.2 mmHg, how clinically significant is that in the first place? I supposed if we can be confident that Medicaid cannot produce a decline of at least 3.2 mmHg on the diastolic that does mean something as I would hope that an anti-hypertensive medication could at least drop that value by 5 points. Of course, a lot of common anti-hypertensives can be purchased for $4 at Walmart so having insurance to go from $4 to (near) free might not matter that much for many first-line treatments. The authors report 95% confidence intervals. That’s what people are using to judge whether this study showed an effect. Please use the online calculator to run whatever variation you want. I cannot judge clinical significance, but maybe a physician reader can. Understood, the 95% confidence interval refers to the alpha (0.05) or risk of Type 1 error. What I was asking was why you chose a beta or risk of Type 2 error of 95% as well. Traditionally, beta is set at 0.2 or 80%. 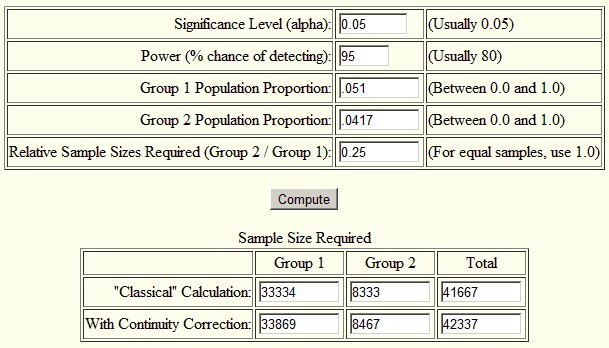 Thus your calculation should be overly stringent to detect a significant difference if one truly exists. 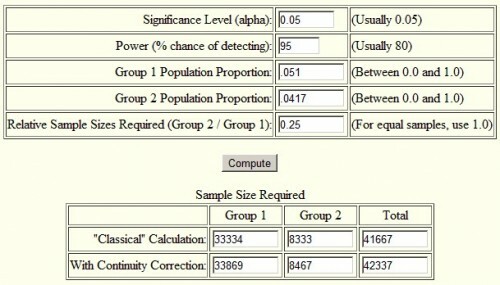 Re-running the calculator with the power component set to 80% still results in an underpowered study. The study would need over 25,000 participants. You showed it was underpowered at the 80% level yourself. Good for you! OK, so I went back to check, and it seems you are right that the CI and beta are different things. So, I don’t see why 95% power is critical, though perhaps it is standard (?). 80% power is conventional for most clinical trials. There are some circumstances under which you’d want it to be higher, namely if you thought the chance of making a type II error was higher or more important than that of making a type I (this could probably be argued in this case actually). Also where are we getting 3.2 DBP from? The authors reported a “change” (I actually am still unclear as to what this means…difference from their own baseline? Different from the control? But that’s another matter) of about -0.5/0.8. That’s obviously not clinically significant, no matter the sample size. But again, these people STARTED OUT with a BP of 119/76. Antihypertensives (and lifestyle modification that might come with increased access) are what are referred to as “regression to the mean” drugs: Someone with a baseline systolic in the 160s is going to see a larger drop, in absolute terms, than someone whose SBP is 119. Which goes back to my previous point of change in BP being a red herring. Seems like something is wrong here. Your power calculations account for the fact that only 25% of the treatment group actually enrolled in Medicaid? But the reported effects (see page 1715) reverse engineer a total causal effect of Medicaid by multiplying the effect they actually find by 4. So wouldn’t this make their effective power higher as well? I don’t see how one can manufacture power by multiplying by four. Power is partly a function of sample size. If the effect size in the paper is driven by multiplying 1) the effect seen in the 25% who signed up by 2) a factor of four, then why would we calculate power based only on the 25% who signed up? Also, how sure are we that scaling up by a factor of 4 is even appropriate? The 25% of the people who signed up for Medicaid might be non-randomly different from the 75% who couldn’t be bothered to do so. Which means that basing effect size estimates solely on the 25% who signed up might inflate the results.